The EYN church at Vinikilang was the first city congregation as EYN intentionally expanded from the country and the smaller villages in about 1978. The meeting place is a large structure in the shape of a cross with roof trusses built like others I have seen only near North Manchester, IL, as in a former barn of Harold and Rosemary Bolinger. The space will hold up to 1500 people easily. [One pastor noted to the writer that in his district the smallest of the twelve churches that Boko Haram had leveled as they destroyed his district completely was larger than Vinikilang.] This structure is built on a massive outcropping of rock that rises above the Benue River which cuts through this portion of Nigeria. Vinikilang #1 was the site of the first trauma healing workshop led by Rev. Toma Ragnjiya and his assistant Dlama. Providing opportunities to heal from the trauma implicit in the tragedy that has overwhelmed EYN is a focus of the Crisis Management Team. Rev. Toma has taken on this task as director of the Peace Program of EYN. This was the first of the ongoing trauma healing workshops that are taking place. Thirty-four mostly displaced pastors were there for this three-day workshop on top of the rock. Themes of the training ranged from stress, trauma, anger and grief to trust and healing from trauma with ample time for sharing personal experiences with each other. Stress, anger and grief are normal human emotions but trauma is an emotional experience that overwhelms the human capacity to recover. What are the steps that help individuals and groups move through trauma to trust, acceptance and healing? How can pastors facilitate that process for their families, congregations and communities? At the end of the first day one pastor noted, “My blood pressure has dropped significantly. I am no longer carrying immense anger toward Boko Haram.” Participants were invited to imagine Boko Haram fighters also dealing with trauma, perhaps sitting with them in the same circle. Rev. Toma estimates that trauma has impacted hundreds of thousands of people in EYN alone. There is a long road ahead for their communities in northeast Nigeria, but these first steps were taken before Christmas, 2014 on the rocky outcropping above the Benue River near Yola. 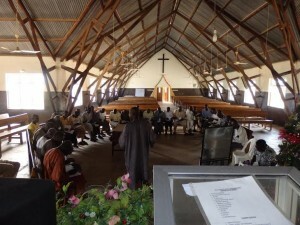 For more information on the Church of the Brethren Nigeria Crisis Response or to donate, visit www.nigeriacrsis.org. Daniel has been a driver for EYN travelers since 2002. He is married with seven living children and lives with a brother who is also married and with one child. His mother is still living and is caring for nine other extended family members. When Boko Haram raided EYN headquarters on October 29th Daniel escaped with all his family and ended up in Jos where he continues to work as a driver with EYN. But he had fields of beans and ground nuts near Mubi ready to harvest when he fled. He does not know if loose livestock have destroyed his harvest. Daniel’s mother crossed into Cameroon for safety when Boko Haram ransacked the areas surrounding Mubi. Her group of ten has faced difficult conditions in the mountains of Cameroon because there has been no relief agencies or government assistance coming to the aid of these refugees. As returnees have reported, “We lived on leaves.” The ten people in her group just returned to the Yola area and are living in the IDP camps that have dramatically increased the usual Yola population. 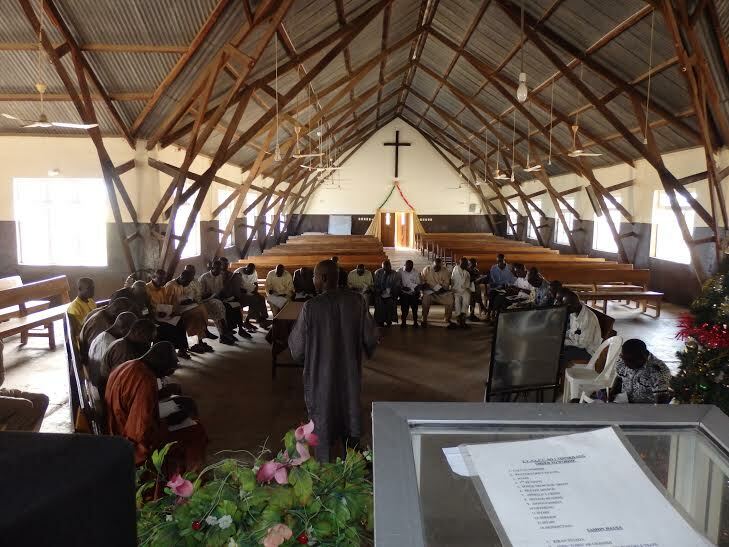 Daniel was able to visit his mother one day while the group he drives for was conducting a trauma healing workshop at an EYN congregation. Though some families are slowly returning to Mubi, Daniel has his job in Jos which helps support the members of his and his brother’s families. He faces a difficult choice between the income-producing job in central Nigeria and the possible harvest and extended family back in the eastern part of Nigeria. What would you do if you were in his shoes? Photo: Dr. Rebecca Dali (on left), Director of CCEPI, leading the distribution. 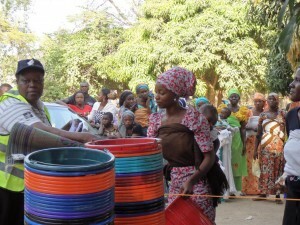 On December 10th the Center for Caring, Empowerment, and Peace Initiatives (CCEPI) team gathered food supplies outside the temporary headquarters of EYN in central Nigeria. Displaced families had gathered and were already registered for ease in distribution. CCEPI is one of the EYN-connected NGOs that is being funded by Brethren Disaster Ministries through its Nigeria Relief appeal. There was a rope outlining the area for supplies and CCEPI team to operate. Rebecca Dali, Director of the NGO, called out names and as families came to the rope each family received a plastic bucket, a large mat, twenty kilograms of maize, a blanket, two soaps and a bag of beans. It was a colorful scene with bright scarves, children being nursed, other children playing in the clusters of people, a corner of elderly folks sitting patiently to receive some assistance and other hopeful, unregistered displaced folks waiting to see if supplies would stretch for them as well. In the background the regular routine of the busy compound continued its usual pattern. EYN staff were in and out of their offices which were being spruced up with furniture to allow a more functional facility. A private school had delivered a huge load of relief supplies to the headquarters earlier that day. There were stacks of yams, toiletries, dried food goods and other edibles ready for distribution to the people displaced from the northeast of Nigeria. Back at the rope around the CCEPI distribution circles of people were sharing with each other. An EYN pastor from Michika who had been hit by three bullets as Boko Haram moved into his home area in September was there, still healing. Though he had not registered he was hoping supplies would stretch to him. A Church of Christ pastor and his wife were among those waiting. He had just finished an office management course and was returning home when Boko Haram reached his region. The family fled to Yola and then on to Jos when rumors of an impending attack on Yola spread. He was the one in the crowd advocating for the group of elderly patiently waiting at the edge of the circle. It seemed these elders were not on the registration list and he wanted them to get first opportunity at any extra supplies. The distribution went smoothly for the over one hundred families. Having it off the road in a closed area with sufficient staff facilitated the process. Only a singing ZME choir (EYN women’s group) would have improved the setting!